Sixty Spring Street condos are chic urban dwellings. These are one of Columbus Ohio’s premier condo options. Located in the central business district, these townhomes and condos offer ease of commute and city living at it’s best. Many of these condos are newer offering the modern conveniences condo buyers are looking for. Sixty Spring lofts feature 20′ ceilings, updated appliances, granite countertops, designer finishes/fixtures and rain shower heads in each bath. Additionally, many condo units have polished concrete floors or hardwood, carpeted loft space, large walk in closets, granite showers, industrial light fixtures and floor to ceiling large windows with beautiful views of Downtown Columbus or the urban garden. 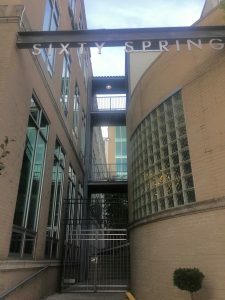 Sixty Spring Street ultra modern condominiums offer fine finishes such as granite, ceramic tile and hardwood flooring. If you are looking to purchase, the Sixty Spring Street condos are a great option for anyone wanting a convenient and easy urban lifestyle. Contact The My Columbus Condo Team today for questions or a private tour of the available units. We have multiple downtown Columbus condo specialists along with Greater Columbus condo specialists ready to answer your questions and take you on a private tour.